Teachers instruct students in a broad range of subjects, from standard areas of study like math, science, and English to other subjects like art, music, and physical education. Elementary school teachers typically when with the same group of students each day at a specific grade level, while teachers in high schools and middle schools will work with a different group of students each hour, typically focusing their teaching efforts on no more than one or two subjects. Depending on the subject they teach and the grade level, teachers instruct students according to a curriculum that includes benchmarks and review processes. They plan, develop, write, and implement programs in the classroom in keeping with school district and state education requirements, keeping records of student achievement and tracking their abilities. Teachers must keep classrooms engaged while still assessing students individually and working one-on-one with students when necessary. Communicating with parents also is a major part of the job, especially when students are struggling and need extra help or attention outside of the classroom. The U.S. Bureau of Labor Statistics differentiates between secondary and elementary school teachers when reporting on wages. While the numbers are quite similar, high school teachers do earn slightly more. The median annual salary of $55,790 covers all teachers, but the top and bottom 10 percent for elementary school teachers come in slightly lower, at $92,770 and $37,340, respectively. All states require teachers to be licensed, and in order to earn a license, teachers need to have earned a bachelor’s degree as part of an accredited teacher training program. Education: Most programs offer separate paths for elementary education and secondary education. Elementary ed. programs typically prepare teachers for teaching kindergarten through about sixth grade, while secondary ed. programs prepare teachers for middle school and high school jobs. Most programs require a minimum of one semester of student teaching. Certification: Specific requirements vary from state to state, but an initial teaching certificate typically lasts for five or six years and covers elementary education or secondary education. Secondary ed. teaching certificates include certifications for specific subjects, such as English or biology. Certificates also often require teachers to complete a certain number of credits toward continuing education in order for the certificate to be renewed when the time comes. Verbal communication: Teachers need to effectively share information with students, colleagues, and parents. When presenting lessons to students, teachers need to be able to do so in a way that keeps students engaged and interested. Listening: Communication is a two-way street, and to assess students effectively, teachers need to be able to understand how and why students might be having difficulty or why they need to be challenged further. Patience: Students learn at different rates, so teachers have to be patient with those who are struggling and devise ways to help them. Critical thinking: Assessing progress is about more than just grading assignments and tests. Teachers need to be able to analyze their own lessons and whether or not they are reaching students effectively. Passion for learning: The most effective teachers generally are the ones who truly love learning. Students recognize this and are more likely to learn to acquire that passion from teachers who have it. According to the U.S. Bureau of Labor Statistics, job growth for teachers is projected at about 8 percent for the decade ending in 2026. This is slightly better than the 7 percent growth projected for all occupations. Several factors influence the availability of teaching jobs. Those certified to teach math or science typically are in higher demand than those teaching English or social studies. As well, there is less competition for jobs in urban or rural settings than there is in suburban settings. So, a math or science teacher willing to work in a densely populated city is more likely to have an easier time finding a job than an English teacher looking for work in suburban districts. Teachers typically have their own classrooms that they are able to arrange and decorate to their own tastes, relevant to the subject matter and level at which they teach. 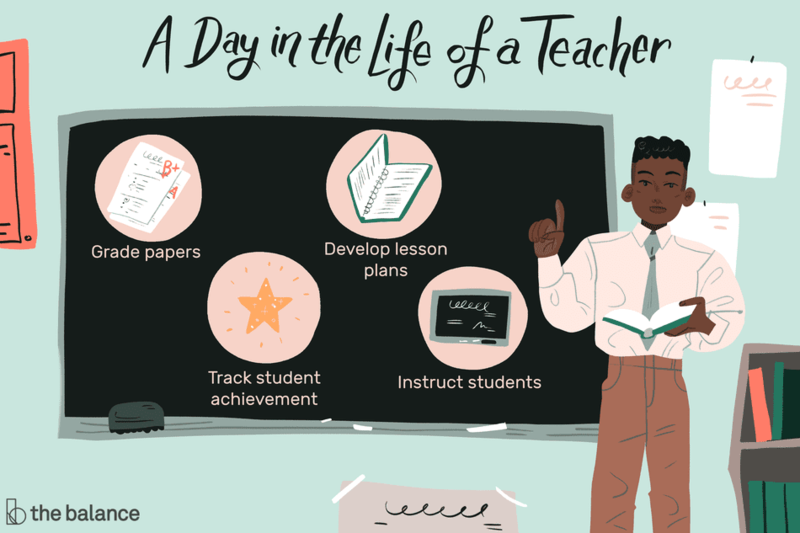 High school and middle school teacher often will teach two or three sections of no more than two or three courses, while elementary school teachers will generally work with the same group of students for most of the day, teaching multiple subjects. School hours vary from district to district across the country, but most schools start in the range of 7-8 a.m. and dismiss students in the range of 2:30-3:30 p.m. Teachers typically arrive 30 minutes to an hour before classes begin and leave 30 minutes to an hour after classes end. Teachers who coach or help lead other extracurricular activities often will work into the evening for practices or games. School years typically last about 40 weeks with an extended summer break, but some school districts spread out their breaks over the course of a full calendar year. Most teachers use their breaks to either teach summer school or to continue their own educations, according to state requirements where they live. Teachers need to earn a bachelor’s degree as part of a training program. Most programs require at least one semester of student teaching, but many other programs expect students to get work in classrooms even before they student teach. Different states have different standards, but they all require teachers to pass a test to earn a teaching certificate.